There's a lot of mandarins around at the moment. I adore them, their light citrus flavour is just perfect for baking and their juice happens to be the 'secret' ingredient for my favourite cupcake recipe. I had an abundance of mandarins thanks to a huge sack of them that we grabbed straight off the tree at A's family home. I also had a ton of chocolate pashmak leftover from my pupcakes, and I thought: citrus and chocolate? Always a great combination! I'm trying my hardest to steer away from the heavy puddings and cakes that I love to make during Winter, now that Spring has finally sprung. This is pretty great for Spring, especially when it's chilled; it's light and zesty, somewhere between a creme caramel and a lemon delicious. 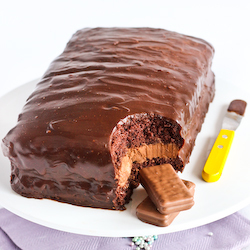 And the fluffy chocolate flavoured pashmak goes so well with it. My special little twist was a touch of lavender, rather than using mandarin liqueur like the original recipe. I think it gives it that extra touch of Spring, more for the scent than the flavour, so everything is very subtle and soft. Preheat oven to 160 degrees C. Remove zest from mandarins with a vegetable peeler and cut into a fine julienne Place in a saucepan of cold water, about a cup, and bring to the boil. At the same time in a separate saucepan heat the 1/2 cup of water with the cup of sugar and stir until the sugar dissolves. Remove from the heat and then set aside. Drain zest and bring to boil in more cold water again. 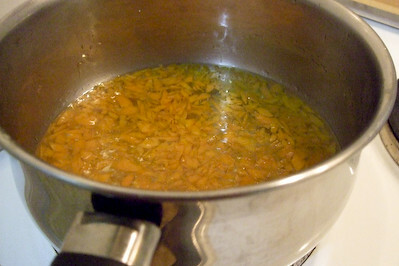 Drain and simmer zest in sugar syrup for 5 minutes. Drain once more. Add zest to cream and slowly bring to scalding point. Cover and set aside to infuse and cool. Juice mandarins and measure. You need 4 tablespoons. 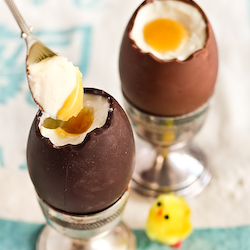 Whisk juice, caster sugar, eggs, eggs yolks and 1/4 tsp of lavender essence (or 1 tsp of lavender flowers). 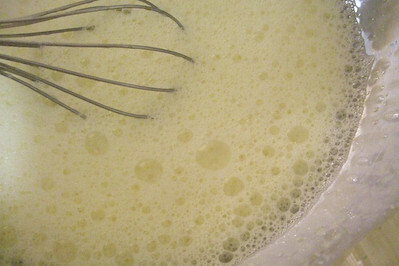 Whisk in cooled cream. 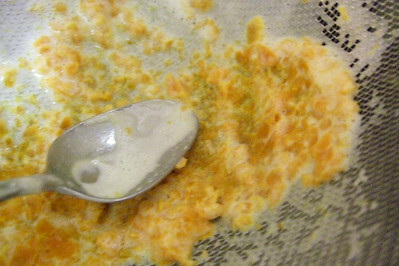 Strain mixture into a large bowl, pressing well to extract every drop of flavour from the zest. Pour mixture into 6 x 100ml porcelain moulds and stand in a baking dish lined with a tea towel Pour in hot water to come halfway up the sides of the moulds and bake for 20 minutes, until just set. Allow to rest for a few minutes in the water bath, then remove and cool completely. 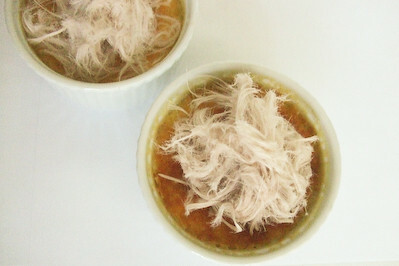 Serve warm or (my personal preference) refrigerate for several hours or overnight and then serve cold and topped with chocolate persian fairy floss. If you prefer to serve it hot, the pashmak will just melt not long after you put it on top of the pots, so you might be better off sticking to the original recipe and serving it with a splash of liqueur, but I really loved it cold. It was smooth and so creamy, but it didn't feel too rich or heavy. 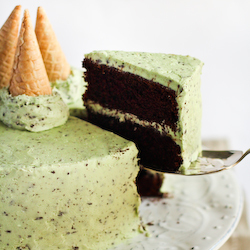 Good looking dessert. how was the texture and did it go with the pashmak? and where did you get your pashmak from? Persian fairy flossssss! steph this looks amazing. I think you should definitely apply for being a pastry chef as im always drooling at your creations. Why do you drain the zest? oh my goodness such decadence! pashmak on everything, i say! 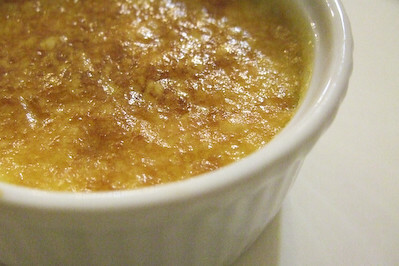 and i'm with you, the creme brulee must be served cold for that cool, slippery feeling. Yay! More pashmak! Great combination of flavours, I agree. Mmm, great idea to put lavender in the creme. And pashmak looks like Santa's beard, don't you think? Lisa - I wasn't sure if it would work but it was surprisingly lovely! As long as you don't overdo the lavender as it can smell quite strong. :) Hehe same, expect a lot more, I have another whole bag and a half of it to get through! Belle - Thanks! I was lucky enough to pick some up at the store that day, so I was just experimenting :) Haha it does, I love how hairy it looks! I love your exotic flavours! The fairy floss makes it very pretty. OH aren't you a clever gal?? I remember that pashmak from the pupcakes for RSPCA! 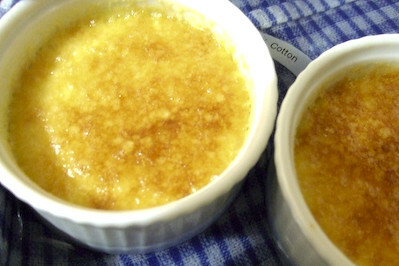 Mmmm and these pots look sooooo good too! 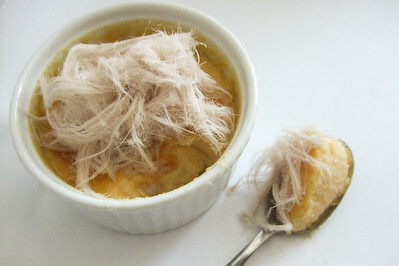 I have never tried Pashmak. It is very interesting. 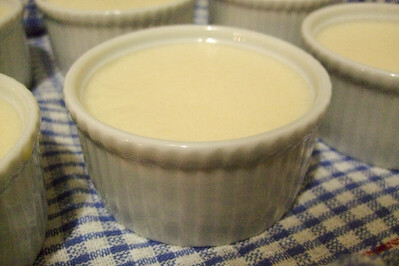 The cream pots looks absolutely delicious. I must say I would prefer these warm with a scoop of ice cream as well as pashmak! But either way they would be delicious mmm! just heavenly. Great idea to add the pashmak to the top, they look like they've come out of a restaurant kitchen! These are so cute! The lavender sounds like a lovely touch, perfect for spring! 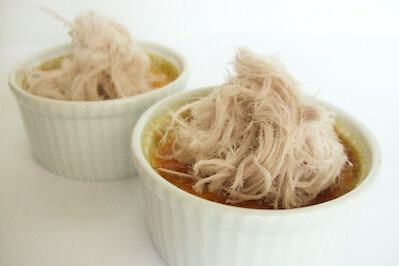 I love your divine dessert & to top that with Pashmak fairy floss must taste divine!! 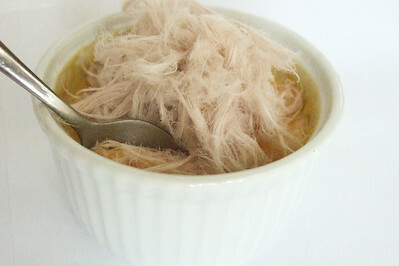 I have Pashmak fairy floss saffron taste at my house!! I love it too! Your pashmak reminds me of your pupcakes! 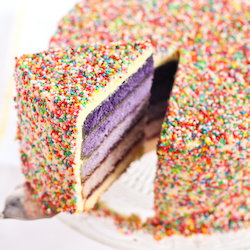 It does at a wow factor to the dessert. Mandarin and Lavender. How interesting!! Arwen - Thank you :) I love the look of pashmak, it's so delicate and fun! Katherine - If you can find it, you should give it a go. It's so fun :) Thank you! FFichiban - Hehe yup I'm sure they're good with a scoop of icecream too! Thanks! Maria - Aww thank you! You're too kind! Betty - Thanks :) I know, spring gives me hayfever but I love all the flowers! Sophie - Ooh saffron flavour sounds fantastic! I will have to try it sometime! Ellie - Hehe thanks! 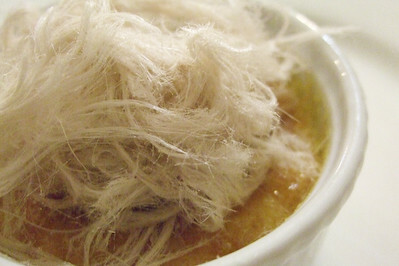 I agree, I thought your pashmak dessert looked so gorgeous!